Research in the Langkilde lab is highly integrative, incorporating approaches from evolutionary, physiological, and behavioral ecology. We are interested in understanding what shapes organismal phenotypes and interactions. Our work applies behavioral observations, endocrine assays, morphological analysis tools, stable isotopes, and molecular approaches to both field and laboratory studies. The goal of our research is to understand how interactions between organisms and with their environment shapes species traits, how these respond to changes in the environment, and the consequences of this adaptation. This work has both basic and applied importance, informing the role of evolutionary processes in assembly and dynamics of natural communities, and our understanding of the resilience and responses of native populations to rapid perturbations caused by global environmental change. We are funded primarily by the National Science Foundation (NSF-DEB, NSF-IOS), PA Department of Conservation and Natural Resources, and National Geographic. We examine the ecological and evolutionary consequences of exposure to various novel threats. This includes the introduction of invasive species that act as predators and toxic prey for native species (fire ants in the USA; in collaboration with Dr. Dan Warner; and on Guana Island) and act as novel competitors for acoustic space (noisy Cuban tree frogs); and the presence of road noise. We explore the impact of these perturbations on behavior, morphology, communication, survival, stress levels, immune function of affected species. And examine the benefits, and potential costs, of species adaptations to these anthropogenically-caused threats. (See media coverage of this research). One of the reasons that stress attracts a lot of attention is because it is thought to affect immune function, growth rates and reproductive output. We study the consequences of the stress-associated hormone, corticosterone (CORT) on these fitness-relevant consequences. We are also testing whether animals that have evolved in high stress environments (i.e. in the presence of predatory fire ants) have strategies to minimize the detrimental consequences of stress. And we use these tools to inform ethical decisions regarding research. But stress doesn't always have the same outcomes. Sometimes stress suppresses immune function, but other times it enhances it. Gail McCormick is examining how frequency, intensity and duration of CORT exposure can affect immune function; a collaboration with Dr. Katriona Shea. Despite the fact that stress is usually painted in a negative light, it plays an important role. 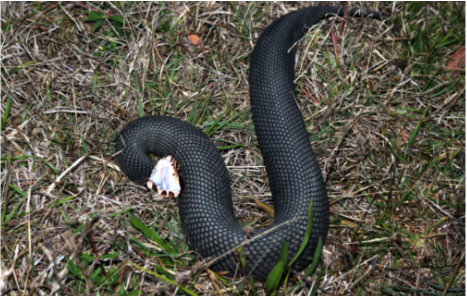 Mark Herr is examining how levels of the stress-associated hormone, corticosterone (CORT), are correlated with the defensive behavior of the cottonmouth snake. We are also exploring the role that CORT plays in facilitating the survival-enhancing behavioral response of fence lizards to attack by fire ants, and associated neural changes, in collaboration with Dr. Sonia Cavigelli. The effects that maternal stress have on offspring are typically interpreted as negative; however, the adaptive significance of these are poorly understood. In collaboration with Dr. Michael Sheriff, we are examining whether maternal stress prepares offspring for a high-stress environment. We are interested in how sexual selection influences an organisms behavioral and morphological traits. Lindsey Swierk is leading research on the evolution and fitness consequences of reproductive strategies in lizards and frogs. This work includes how male and female lizards choose their mate; how males adjust their behavior to competitors; whether frogs with an explosive mating system use strategy at all; the benefits of competition for providing females the best quality mates; and whether sperm is really cheap. A new research focus examines why some female lizards have residual male-typical badges, whereas others do not. These "bearded" ladies appear to suffer reproductive costs, and we will be exploring hidden advantages that may offset these. (See media coverage of this research). For centuries, fire served as a natural disturbance within the landscape. Today, forest managers are tasked with reintroducing these historical disturbances through prescribed burning, in hopes to improve habitat and wildlife resources throughout the landscape. Unfortunately, we have a poor understanding of how species will respond to these prescribed fires. 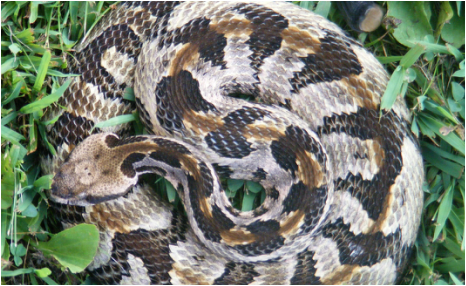 Chris Howey is leading a project to determine the short-term impact of these forest practices on taxa of concern; the timber rattlesnake and vernal pool amphibians. In the United States, the number of chemicals produced has tripled in the past 50 years. Among these are “emerging contaminants” (ECs), which include hormones and pharmaceuticals. The presence of ECs in water bodies is currently not regulated due to a lack of understanding of the ecological risks. 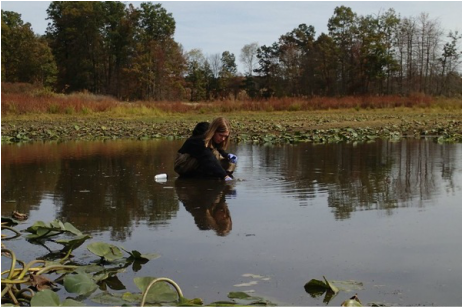 We are collaborating with Dr. Heather Gall to determine if native amphibians are affected by, and have adapted to cope with, the presence of “cocktails” of multiple contaminants in vernal ponds. No, these aren't just toys. They're living real organisms. In fact, they're the larva of a moth living inside the seed pod of a shrub. The female moth lays an egg on the seed pod while still on the tree. The emerging larva enters the seed pod, consumes it's contents, and sets up residence in the fallen pod until it emerges as a moth several months later. The larva makes the seed pod roll around on the ground and jump into the air by walking around and slamming it's head against the pod walls. Surprisingly little is known about the adaptive significance of this remarkable behavior. 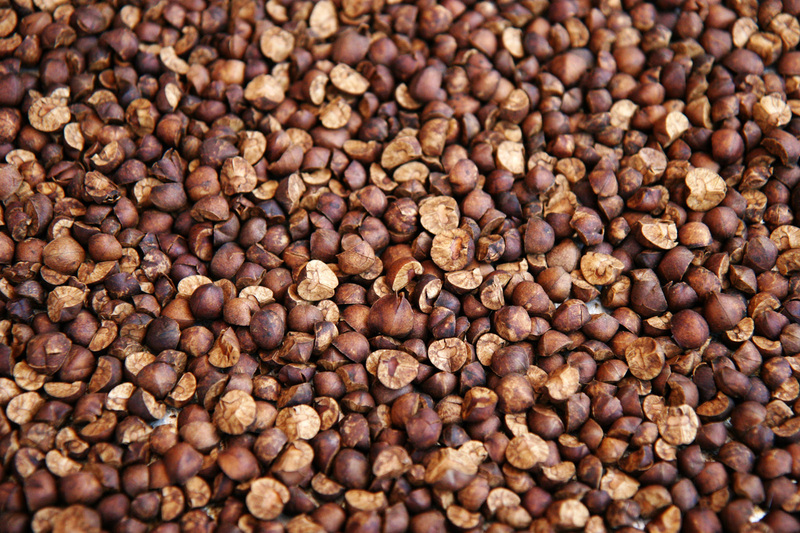 Cecilia Zemanek and other undergraduates in the lab have been exploring why these intriguing jumping beans jump, and why some beans jump more than others.